To order this item, contact customer service at 614-688-4357, or toll-free at 1-800-678-6003; 614-688-3425 (fax); units@osu.edu. *One-time order fees apply when ordering this phone. Price subject to change. 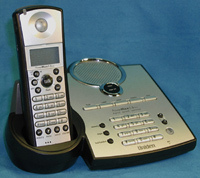 Note: To have a hands-free conversation, use the handset speakerphone by pressing the spkr button at any time. The redial memory function in the base and handset are independent from one another. Only the first 32 digits are retained for redialing. Note: To have the handset automatically answer a call when you lift it from the base, choose Auto Talk On. This setting also allows you to press any button on the handset to answer a call when it is not on the base. Note: You can also temporarily mute the ringer of the handset: When the handset is off the base and the phone is ringing, press end. The ringer will return to its previous setting with the next incoming call. Continually press ringer on the base to select High, Low, or Off until you reach the desired setting. While on a call, press the + or buttons to adjust from Low, Medium, High and Maximum. A tone will sound when you've reached the top and bottom of the settings. Note: When you hang up, the phone keeps the volume setting last selected. While on a call, press the down arrow or up arrow buttons to adjust from 10 different volume settings. A tone will sound when you've reached the top and bottom of the settings. To cancel the transfer, press talk/flash on the handset. When switching a call, all keys on the handset are disabled except talk/flash and spkr. Press talk/flash or spkr on the handset. To cancel the transfer, press transfer or the speaker button on the base. Press find handset on the base. The handset beepsfor 60 seconds, and Pagingappears on the handset display. This phone allows 3-way conversations between the handset, base, and an outside line. Press the speaker button on the base to initiate the 3-way conversation. To hang up, press the speaker button on the base. The handset will still be connected to the call. Press talk/flash on the handset to initiate the 3-way conversation. To hang up, return the handset to the base, or press end on the handset. The base will still be connected to the call. If you press xfer/del on the handset during a 3-way conversation, error tones will sound. If the base and handset do not connect in 30 seconds, the operation is canceled. When the memory is full, you will hear a beep and "Memory Full" will appear in the display. The pause key (redial/p) counts as one digit. Press redial/p more than once increases the length of pause between numbers. If you select a speed dial location where a number is already stored, the new number will replace the old number; the old number will still be stored in the phonebook. The memory locations in the phonebook are not limited to phone numbers. You can also store a group of numbers (up to 20 digits), that you need to enter once your call connects. An example of this is a bank account number. The 10 memory locations in the base are independent from the handset. If you get an incoming call, you will have to start over. not have a stored number, the base will beep rapidly and the phone will not dial. If the number is in your phonebook with a name, the name will appear in the Callers List. This phone uses the Uniden BT-446 battery. A fully charged battery will last for 4 hours continuous use/ 8 days when the phone is in standby mode. To maintain a good charge, clean the battery contacts on the handset and base unit with a dry cloth or a pencil eraser about once a month. Do not use any liquids or solvents. Recharge your phone on a regular basis by returning the handset to the base after each call. This phone displays incoming local and campus telephone numbers. Only telephone numbers are displayed, not names. Most incoming long distance numbers will not be displayed, rather the display may read "AT&T", "MCI", "Sprint", etc. The number will be displayed on the second ring. As in the public network, any caller can block their number from being displayed on your telephone. NOTE: Caller I.D. is not available at the OSU airport or Regional Campuses. Administrative DID numbers (292, 688, and 247) will display their numbers to a Caller I.D. receiver stating "Ohio State Univ + 292-xxxx, 688-xxxx, or 247-xxxx). Administrative Non-DID numbers (4-xxxx) will not display their phone numbers and will display an Out of Area message. You can block your number from being delivered to a Caller I.D. receiver by dialing *67. If you prefer, you can request to block all outbound number delivery so that you would not have to dial *67. However, by doing so, inbound caller I.D. would also be blocked. If you have call waiting service and a call waiting tone sounds while you are on a call, press talk on the handset or flash on the base. There is a short pause, then you will hear the new caller. To return to the original caller, press talk on the handset or flash on the base.